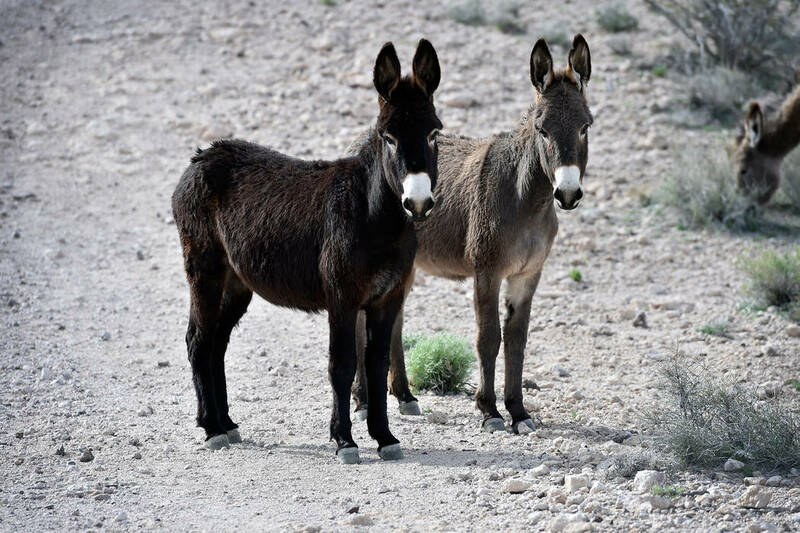 Bureau of Land Management is investigating with assistance from the Nye County Sheriff’s Office, which fielded the first report of three dead burros on May 5. David Becker/Las Vegas Review-Journal Wild burros are seen in the hills above Beatty, Nev., on Tuesday, March 1, 2016. The U.S. Bureau of Land Management, with the help of the Nye County Sheriff’s Office, is investigating the shooting deaths of 13 wild burros in desert locations in the Beatty area. The first three dead burros were discovered May 5 by a geologist for Northern Empire, one of the companies operating drill rigs in the area exploring for gold. Those animals were in the area of Secret Pass, not far from the former Daisy Gold pit. The next day, water truck driver Dave Benham, noticed an odor of something dead not far from what locals call the Cheese Holes. He told deputy George Wehrly, and this led to the discovery of four more dead burros. Three other burros were discovered by a Sterling Mine employee in an area not far from that mine in an area referred to as Chuckwalla Canyon. Brad Hunt, who was called upon to bury some of the dead animals said, “Whoever did it knew what they were doing,” because the shots were knowledgeably placed for a clean, quick kill. Hunt said that he is not particularly fond of the burros, but that this is no way to get rid of them. He said he’d just as soon shoot the guy who shot them. The law doesn’t go that far, but the illegal killing of wild burros is a felony, and is punishable by a fine of $2,000 and up to a year in prison. The BLM is seeking the assistance of the public in identifying whoever is responsible for the shootings. Anyone with information is invited to call 1-800-521-6501. Wild horses and burros are federally managed and protected under the Wild Free Roaming Horse and Burro Act of 1971.